Croatia's towering concrete blossom grows from the site of a World War II concentration camp. 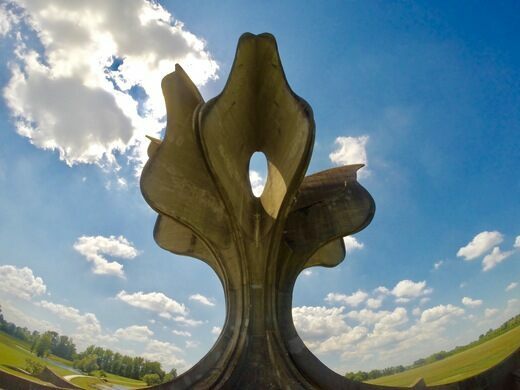 Created by famed sculptor Bogdan Bogdanović, the stylized Stone Flower in Jasenovac, Croatia is a dream-like cement construction where visitors can enter the roots of the massive flower to remember those who died in the concentration camp which once sat on the site. An ethereal glowing blue ocean cave in Croatia. 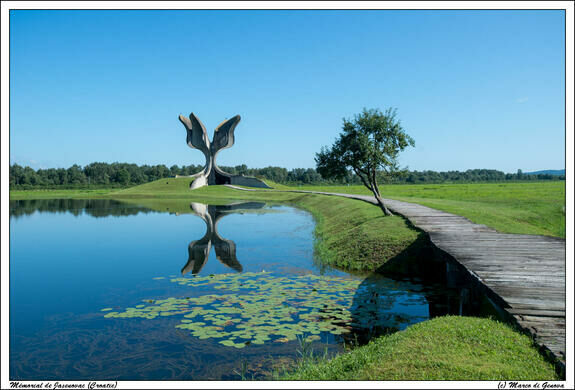 Completed in 1966, the five petals of cement are dedicated to the victims of the Jasenovac concentration camp which, unlike many of the more well-known Nazi camps, was not operated by the German regime but instead by the Croatian government of the time who were allied with the Reich. Despite the independent operation, the camp became one of the largest in Europe. While the exact number of victims who were killed in the camp is unknown it is now believed that as many as 800,000 people perished, many of them Serbians, who were being exterminated in an effort to create a “pure” Croatia. The horrifying camp was closed in 1945 and razed immediately afterward by former POWs. The Stone Flower that now stands on the site covers a tomb containing some remains that were exhumed from a nearby mass grave. The “roots” of the flower are open and people can head beneath the monument to see a group of plaques that have been placed there. Even though the grounds are gone and the name has been overshadowed by other sites, Bogdanović’s monument is a striking reminder of the atrocities that took place there. This brutalist monument is inscribed with 9921 names of Yugoslav partisans who perished during WWII. This stunning, out-of-the-way Croatian monument commemorates a community's uprising against occupying fascist forces. Two bulls enter. One leaves a champion—but neither loses its life.